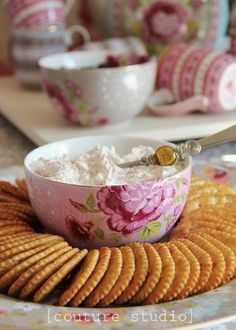 Spring in Your Tea Cup Party! Infusers to Brew Your Tea! *These are not affiliate links~ we really do LOVE these creative businesses and know you will too! We’ve had the great privilege of getting to know these amazing artisans and using their wonderful products! They are all truly inspiring creatives! Enjoy! Isn’t this porch dreamy! It belongs to Eileen & James Curinga, creators of Sand Dollar Lane, Coastal Exploring and Leen the Graphics Queen ! It’s one of our favorite porches to sip tea on when we visit North Carolina! Check their beautiful blog full of creative ideas for your home over at Sand Dollar Lane~Coastal Living ! And then check out Laura Loxley Vintage! Her page is full of more beautiful things for your home too! Beautiful fabric arts for every decor from Boho Modern to Coastal Farmhouse! Denise Kerley is the creative genius behind Kerley Crafts. Her work includes beautiful hand-stamped and painted ornaments for every life occasion! Click on the image to visit her amazing Etsy shop! Join the Tea Tribe for a special Welcome Coupon!